The Indiana University Panhellenic Association works with many organizations around campus. Below are some of the organizations our Panhellenic community work closely with! The Indiana University Greek Community is a community of individuals from over 72 Greek lettered organizations. These organizations are across four different councils: Inter-Fraternity Council, Multi-Cultural Greek Council, National Pan-Hellenic Council and Panhellenic Association. Below is more information on the three other Greek Councils! The Indiana University Inter-Fraternity Council is comprised of 30 organizations on Indiana University's campus. 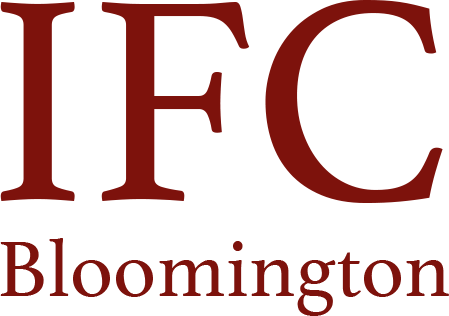 Learn more about IFC here. The Multi-Cultural Greek Council includes organizations focusing on Latino/a–based, Asian-American/South Asian, and multicultural organizations, totally in ten organizations. Learn more about MCGC here. The National Pan-Hellenic Council, Incorporated is composed of nine historically Black National Greek Letter sororities and fraternities. Learn more about NPHC by clicking here. The Circle of Sisterhood Foundation is a way for sorority women across the world to be united in a common philanthropy, bring education to women across the world. At Indiana University, Circle of Sisterhood is a way for our community to join together in a common philanthropic cause. Currently, our community is working to raise money to build a school in an underprivileged country. Please click here to learn more about Circle of Sisterhood! Indiana University Dance Marathon is a 36-hour Dance Marathon that takes place every November at Indiana University with the purpose of raising both funding and awareness for pediatric care. Many PHA chapters and members participate in fundraising and dancing for the kids! Please click here to learn more about Indiana University Dance Marathon! National Panhellenic Conference is a conference of 26 national chapters advocating for women. All of the Panhellenic chapers' national organizations on Indiana University's campus are a part of the NPC. Please click on the link here to learn more about NPC! Student Life and Learning is the Indiana University advising body for the Panhellenic Association and all student organizations on campus. SLL works with Greek organizations to help provide members with opportunities to lead, serve, build positive relationships, and grow intellectually. Click here to learn more about SLL!